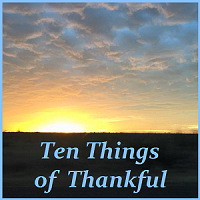 I have been a terribly sporadic visitor to the Ten Things of Thankful blog, but every time I go, I’m rewarded by the words, photos, and humor from such encouraging folks. It’s a great place to share gems of thankfulness. Gem #2: The patient families of the kiddos I teach, who must wonder if my body is falling apart. Yes, it is. Gem #3: The Bible in One Year 2019 devotional by Nicky and Pippa Gumbel. They are an amazing couple, perhaps best known for developing Alpha courses. OK, I am now 42 days behind in reading, but onward, ever onward! Gem #4: Thanks to Cee’s inspiration and support, I have a REAL camera! It was a delightful Christmas present, heavily-researched by my dearest widower (see #1). I haven’t used it much but I look forward to the day…. Gem #5: Cadbury’s milk chocolate, which remains sweet and silky and mood-changing. Gem #6: Faithful followers of my blog, despite my erratic posting. Thank you!!!!!!!! Gem #7: Suzie’s kind support and encouragement. Check out her amazing blog (Suzie Speaks), her cat’s bottom, and her new job! Gem #8: My own Fitbit, a birthday present from my fam. Fitbit and I love each other. It purrs on my wrist. It cheers me on, even as I feel like body parts will soon start dropping off. Gem #9: Amazon Prime wardrobe, which means I never have to expose my feet to strangers again. No one fainting in horror at a shoe store. Gem #10: A physical therapist who reminded me to be thankful I have feet (even if you can find them by googling “ugliest feet in the world”). That PT works with folks who have prosthetic feet and they would give anything for my ugly feet. Freebie: Don’t search for ugliest feet in the world. Davina Lyons, a middle school teacher, blogger, and workshop facilitator, has nominated me for a cool blogging award. Wow! I didn’t see that coming! I know I can’t live up to that description, especially with my erratic posting, but it’s sweet to be nominated! I am nominating the awesome group below. Some folks do not care for this process, so no pressure! Here are the rules of this award and my nominations below! Three things about me: I love Jesus, my dearest teaching widower, and my students. In my next post, I’ll answer some questions and add my own. Well, I might just copy Davina’s cuz she’s better at this than I am!! In a previous post, I promised to share a photo of my painting efforts. The room is no longer bare! Good thing I painted it while I could still use my right arm! As far as I can tell, once you enter this mini-street, you’re there for life! One way, with no outlet? This is my entry for Cee’s Fun Foto Challenge: roads. I do wonder what’s down this road but I haven’t had the courage to check it out! The January 2019 issue of Mathematics Teacher has a fascinating article on the use of action research in a middle school math class, with applications to all levels of math instruction. A brave teacher/researcher collaboration analyzed student interactions and explored ways to improve engagement. Teacher and researcher collaboration. If you don’t have an available researcher, do it yourself! Videotape yourself! Work with a colleague. Use a seating chart to quickly visualize and compare student interactions. Prepare higher level questions ahead of time and place them in your lesson plans. Without your “cheat sheet,” you’ll likely default to more rote level questioning once the lesson starts rolling. Allow time after student responses to encourage student follow-up instead of teacher-student-teacher-student patterns. Select authentic and meaningful tasks when possible. A subscription to Mathematics Teacher is a great investment! Oh, how I love to hear this man! His sweet and amazing range, his passion for Jesus, and his diverse style- what’s not to love? Click below to hear one of my favorite Christian rock songs. I just greedily devoured the five Alex Fletcher books by Steven Konkoly. Ooh-rah! I am ready to stockpile food and water and toilet paper. In the first book, The Jakarta Pandemic, Alex struggles through PTSD to save his family from the collapse of American society. His innate paranoia kicks into insane levels, but Konkoly makes the plot eerily realistic. Just how do you survive a contagious virus that triggers mass hysteria and a loss of infrastructure? I’m thinking a chocolate stash…..
Konkoly draws upon his military experience for amazing realism in The Perseid Collapse, an “event” that forms the basis for the final four books of the Alex Fletcher series. This event crumbles the United States, which had barely recovered from the pandemic of a few years before. Alex is better prepared this time but the stakes are higher. The event, which many speculate is an EMP, or asteroid, leads to a collapse of all the major cities, electronics failure, and a flood of refugees. Alex is on a mission to rescue his son from Boston, getting trapped between hastily assembled marines and militias. The final three books remind me of Tom Clancy’s or Robert Ludlum’s style in their complexity and global focus, with heroic characters giving their all as the world changes mightily after the collapse of the US. And Alex continues his single-minded focus on saving his family and friends. Konkoly creates a well-developed character in Alex Fletcher, along with a wide cast of supporting folks. An interesting theme in these books is the conflict between “government conspiracy” folks and the military. I don’t know how such an apocalypse might fall out (pun intended), but our house is not prepared for any of it. I’m off to buy some chocolate. Great news for all of us, regardless of our age! Being bilingual, which historically has not been the norm in America, is great for your brain. For older folks, a second language can lessen the rate of decline in working memory, processing speed, and overall efficiency. What about the issue of whether it’s easier to learn a language when you’re young? You know, the brain plasticity phenomena? Well, that argument can be countered by considering the conditions under which many adults try to learn a second language. For myself, trying to squeeze in the time and opportunities to practice a second language have doomed my efforts so far. I reached a point with Spanish where I could follow a sermon with minimal support. Right now? I shudder to think. The conditions under which children learn a second language at home are typically supportive, allow for errors, and provide lots of practice. Learning a second language at school really requires expertise and educational leadership. Those once-a-week-30-minute “immersion” classes with songs about colors and numbers have not produced a generation of bilingual students. Teaching a second language requires competent leadership and community involvement, with a systematic plan for advancing student skills as they move from elementary to middle school and beyond. As for special needs students, pulling them out to provide specialized instruction often occurs during “foreign” language classes. For students who are not communicating well in one language, that makes sense. And if those second language classes were truly effective, we wouldn’t want anyone to miss them.